I have been wanting to do this creepy doll photo shoot for over a year now… the only thing that was holding me back was finding the right dress. While out and about yesterday, I happen to run into a dress that would work! And today, my daughter stayed home to job shadow my photography career. She took a turn modeling for me and watching me edit the photos, and next she will take pictures and edit photos herself (with my help of course). 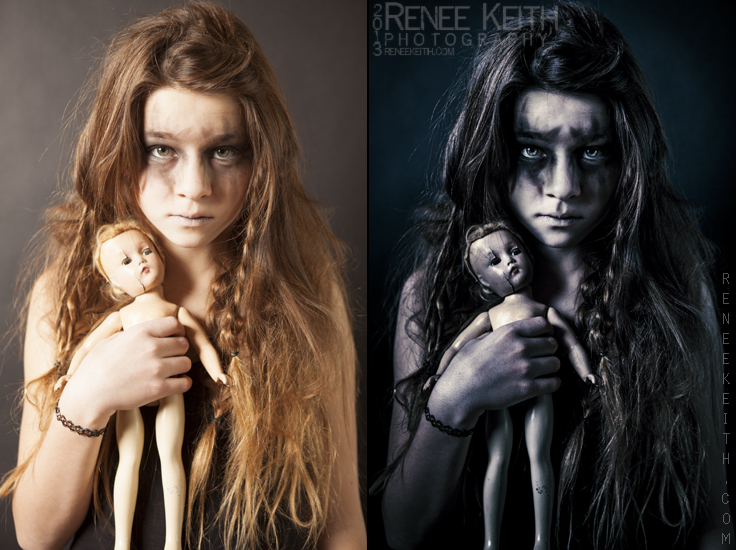 Makeup and Photography by Renee Keith. Above: before and after editing in Lightroom and Photoshop. Makeup usually turns up a lot lighter in studio lighting… so of course I darkened it in post.